EXPLOSINGWATER to RUN YOUR CAR : yes, water can burn and also explode ! ## 2005, a guy said he was running his car on water explosion, by adding a second source of electricity (a converter 12/110) to the basic ignition coil of his V8 car, to create a stronger spark, he was able to run it just on water sent to the carburetor, in place of petrol, and exploded with the plasma electric arc. There are a number of ways to operate an internal combustion engine using only water as fuel.The traditional approach is to separate water into hydrogen and oxygen gas using electrolysis, however, this process is quite inefficient.To improve the efficiency of electrolysis, various inventors have sought to stimulate water at its resonance frequencies and thus get more gas production with less energy inputs.This approach works, however, problems have always been in making enough gas on demand as needed by an engine, noting that storing H2 and O2 is a highly explosive alternative that should be avoided. Others have tried chemical reactions with water to produce hydrogen gas.The typical approach is with sodium hydroxide (NaOH) and aluminum which will produce enough gas so long as you have empty aluminium cans to keep the car running.Sodium hydride (NaH) is even more reactive, but highly dangerous to handle unless properly encapsulated as a company called Powerballs, Inc. is proposing.There are many other chemical reduction reactions that can be used, however, the metals become more costly and re-refining or reprocessing the waste water will be a messy problem.Not such a good ecological approach. 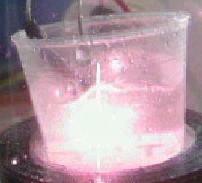 A recently revised approach is to use a plasma arc to dissociate water.US Magnegas Inc. does this in reactors that recycle carbon-based liquid wastes like sewage, used cooking or automotive oils, soaps and cleaning solvents, and so on, to produce a stable and compressible “Magnegas” which has been very successfully combusted in ordinary vehicles and can be used for cooking, metal cutting or in various power generating technologies.This is a worthy approach for liquid waste disposal and generation of a limited amount of usable gas for running vehicles. The latest watercar technique utilizes a little known “exploding water” technique.This is based on a high capacitance discharge in water or water vapor which causes a “cold fog jet” pressure pulse together with light flash and sonic concussion. This is basically a lightning and thunder reaction and is the approach that shows the most promise when applied to an internal combustion engine.This is the recommended approach as it requires less energy and produces a powerful result without consuming the water, which is simply recycled repeatedly in order to achieve 300 mpg or more. An automotive mechanic who goes by the Internet name of s1r9a9m9 has the distinction of making the first plasma fog jet watercar.He did this somewhat by mistake using an old 1978 Chevrolet El Camino with a 350 cu in engine.His ‘eureka event’ happened when he accidentally dropped a 110v AC wire into a bucket of water.This resulted in an immediate explosion in the bucket.He thought that that was really cool so he did it again but with a board over the bucket this time.Well, the 2 x 4 imbedded itself in his shop ceiling so he concluded that that wasn’t such a neat thing to do again, but if he could get the same explosion to happen in a car engine, now that would be something! ..and he has put over 30,000 miles on the car to prove that it works. The other thing he had to do was to increase the water flow to the cylinders.This he did by increasing the jet size in his carburetor to about 2 sizes larger.This allowed more water vapor into the cylinders for each firing and consequently gave a stronger reaction. A better design is to first rectify the AC through a single diode (half wave rectified) or through a bridge rectifier (4 diodes) to give 110v (or 220v) DC and merge this with the HV DC through a HV diode and then to the plug arc ground. One member of a WaterFuel1978 Yahoo! Group claims to have replicated the “S1r9a9m9” water car system. Electrohydraulic Metal Forming may provide a clue. Faraday had discovered over a hundred years ago that an electric arc explodes louder through a water mist than through normal air. Others since have created water explosions with high voltage arcs. Since 1950 this phenomena has been used in sheet metal forming. … Researchers for a mining institute discovered that the force the water exerts is 156% of the power input through the charge and that after multiple firings there was neither a pressure nor temperature increase in the water. This would make it appear that all of the energy input to the system is released as kinetic force as well as the 56% overunity energy. … The strong reaction of water to high energy high voltage arcs has been studied by major universities, mostly in the earlier part of the 20th Century. Only one spark plug hook up is shown. Each plug must have its own relay connection to both the negative HV from coil and from the 110V 400 watt inverter. 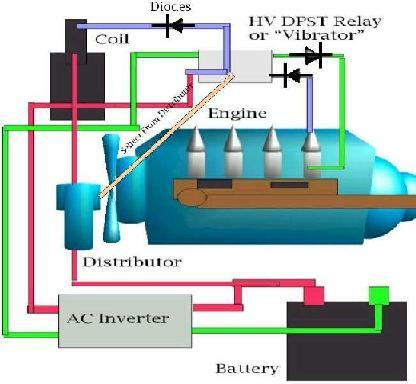 It is not clear whether the Inverter power is rectified with 1/2 or full wave bridge rectifier. The HV from the coil is probably negative from the collapse of the coil. Since the HV is probably negative 20-30KV the 12V ground becomes the more positive lead even though it is coming from ground. The violet colored wires in the diagram illustrate this negative HV with the 110V 4amp together going into each relay and plug. The reader is cautioned to understand the system and all necessary safety precautions before working with the high voltage and 110V 4amp piggyback wiring scheme. ## Details on water explosion to run a car ; IT’S POSSIBLE ! The unusual strength of explosions caused by a pulsed current flowing through water plasma was first noticed in 1907 by Trowbridge (1) in his early high voltage laboratory at Harvard University. When he passed an arc through a spray of water, the resulting explosion was louder than in ordinary laboratory air. During the second world war, Frungel measured the strength of water arc explosions and published his results in 1948 (2). He concluded that they were not caused by heat and steam and freely admitted that he was unable to explain the phenomenon. Soon after Frungel’s publications, water arc explosions found applications in electrohydraulic metal forming(3) and underwater pulse echo sounding (4). In 1969, the US Bureau of Mines issued a long report on their investigation into using water arc explosions for rock fragmentation (5). In one experiment the investigators at the Twin City Mining Research Center noticed that the energy output was apparently 156% of the input. Not until the mid-1980s was the scientific basis of the puzzling explosions more extensively researched. At MIT (6,7). 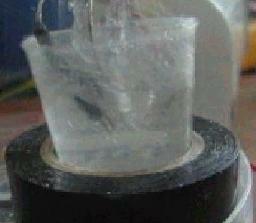 It was shown that the discharge of 3.6 kJ of stored capacitor energy would create pressures in excess of 20.000 atm. In 7 ml of water. 3.6 gm of water was ejected from an accelerator barrel at a velocity of the order of 1000m/s, sufficient to penetrate a ¼” thick aluminium plate (8). While not in all, but in many discharges under differing experimental conditions of varying capacitance, initial voltage and water volume, the kinetic energy of the water jet was larger than the electrical energy that had been stored in the capacitor bank. The data shown in figure 2 reveals both the over unity performance of the water accelerator and as well further evidence that the amount of energy released depends on the energy stored in the hydrogen bonds. It can be seen that the temperature of the water which is directly related to the extra vibrational energy in the hydrogen bonding network has a direct effect on the energy of the fog jet. ## Electrodynamic Explosions in Liquids, P. Graneau, P.N. Graneau, Appl. Phys. Lett. 46(5), 468-70, (1985). Citations from the book of Moray King, Tapping the zero point energy, ISBN 1-931882-00-2. # Page 82: Ion motions or oscillations can be induced in electrolytic solutions as well. Graneau (38), in experimenting with explosive discharges in salt water, observed a threshold phenomenon related to the sharpness of the pulse excitation. Unless the pulse rise time was sufficiently large, an ordinary discharge would occur in the water and yield no motion. But with the same total pulse energy, when the rise time exceeded a certain threshold, the water would jerk upward explosively. Clearly there is ion motion in this event. Perhaps a similar phenomena happens for those inventors who claim energy anomalies when pulse charging an electrolytic battery. Puharich (39) claimed observing an energy anomaly by electrolysis of water where the excitation signal matched the resonant frequencies of the water molecule’s bonds. This would also induce ion oscillations. If abrupt electrolytic ion motion produces a self-organizing interaction with the ZPE (or an orthorotation of its flux), it could explain the energy anomalies in systems where electrolytic ions are excited. # Page 98, Reference n 38: An experiment is reported where electric arc currents produce explosions through salt water by electrodynamic forces. The explosive phenomena can be explained with the aid of longitudinal Ampere forces, but not with traditional Lorentz forces. A threshold phenomena is observed below which an ordinary discharge produces no motion in the liquid, but above which a violent motion is induced. (During the explosion, there is obviously ion-acoustic activity. This experimental arrangement may make a convenient transmitter for generating a macroscopic vacuum polarization (reference 8). A similar phenomenon may occur in those ‘free energy’ devices that pulse charge a battery’s electrolyte. It may be more convenient for experimental purposes to induce ion-acoustic activity in an electrolytic solution than in a gas discharge plasma tube). 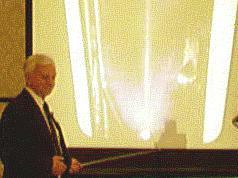 ## Electrically Induced Explosions in Water by Gary Johnson, Kansas State University. A 2 mf capacitor was charged to voltages in the 1-10 kV range and discharged into a water column through a 38 mH inductor. At voltages up to about 6 kV, the water acted as a relatively high resistance and the circuit decayed as an overdamped RLC circuit. Resistance decreased with time. When the resistance dropped below about 10 W, the water would explode if the capacitor still had sufficient energy. The loudness was distinctly greater than an equivalent amount of gunpowder. Conclusions : Electrically induced explosions in water are relatively easy to produce with a 2 uF capacitor charged to 10 kV. Expanding steam does not seem to be the main cause. Similar explosions are obtained with significantly different peak currents, which raises questions about the longitudinal Ampere forces being the primary cause. It is therefore conceivable that we are tapping a new energy source. Water Atomization by High Magnitude Electrical Impulses: A study. After several discharges the pressure inside the box remained at 1ATM. If the water was being vaporized by the discharge a phase change expansion would be expected and hence some pressure increase should be observed. Similarly, if the water was being split up into hydrogen and oxygen by electrolysis, an even higher pressure increase should be observed. More importantly, there was no “fogging” inside the box, further refuting any steam condensation claims, and the temperature change was consistent with my theory that the water is not being vaporized. If only a small amount of Hydrogen and Oxygen was being produced, it could diffuse into the liquid and remain there in gaseous phase. In fact, analyzing the light emitted by a silent arc inside the atmosphere of the box with a chromatograph after 20 discharges showed the characteristic red line of hydrogen, as well as all usual signature produced by nitrogen and oxygen in air. But how can a shock wave be produced when the net pressure change is zero? Conventionally, shock waves are produced by explosives, such as nitroglycerine, which upon being struck or heated above 280C, decomposes to give 10 000 times its original volume in gas. This tremendous expansion gives rise to a shock wave traveling at 4500 M/sec. The shock wave can be thought off as a sound wave, or, more accurately, as a pulse traveling through a medium of some sort. In an explosive this pulse is provided by the initial expansion, which pushed air molecules outwards at a very fast rate. Because gases are produced, a net pressure increase is observed. In the water atomization experiment, the shock wave implies that there must be an initial pulse, or expansion, but the zero pressure increase tells us that this change is non permanent and very quick. We can therefore rule out vaporization, and electrolysis, as both would result in a permanent pressure change. I recently read an interesting patent which describes a capacitor driven water droplet launcher. U.S. Patent 6,220,141 “Liquid Projectile Launcher” claims that this device can deliver a water droplet at high speed (1000 m/s, ~Mach 3) at “short to medium range”. The authors also suggest various additives to the water to produce desired effects on the target. These include humanitarian substances, such as vaccines or antibiotics, as well as more nefarious materials such as acids, bases or solvents to generate a pain response (having at one time or another spilled all of these things into open cuts, I can testify that they do indeed sting), capsaicin (hot pepper oil) for more serious pain, or histamine (do not pass go, do not collect $200, go directly to anaphylactic shock). For more ideas along these lines, see my chemophobia http://members.tm.net/lapointe/ChemTox.htm page. 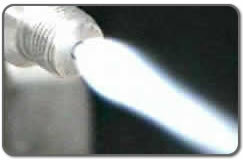 Upon closure of switch 40, the patent claims that a portion of the projectile is converted into a 3000-6000 ºC plasma which is accelerated down the conductive portion of the barrel, like the plasma armature of a rail gun http://members.tm.net/lapointe/EMGuns.html , pushing the remaining portion of the liquid projectile in front of it. One of the old postings on the “weird science” page involved a report where a column of water in an ultrasonic resonator flew upwards and punched a hole in the ceiling an in the roof above. See Keely ultrasonic explosion http://amasci.com/freenrg/h2oblast.html . While waiting at the opening of the “Steamboy” movie, several things suddenly fell into place for me. First, guess what happens if we leave some water for hours under high powered ultrasonic treatment? This degasses the water, removing all the dissolved air. Heating the water increases the effect. Second, what happens if we strongly heat some thoroughly-degassed water? If microbubbles are lacking, then the water temperature will rise far above 100C, and the water will be massively superheated. It may even superheat to such an extent that, once it starts boiling, the entire volume of water may convert to vapor. Finally, what happens if we place water in a resonant ultrasonic chamber where the transducer is located at the bottom? In that case the pressure excursions will be maximum at the surface of the transducer and at the surface of the water. But the upper water surface will cool by radiation, so if cavitation were to commence, it would be at the bottom of the water column against the transducer. All together, this is a recipe for a cannon, but a cannon where the bullet is a slug of water propelled by its own steam output. A tiny bubble will break out at the bottom of the water column, and the bubble will instantly fill with live steam. The water column will be smoothly accelerated upwards as the superheated water emits a downwards “exhaust” of hot water vapor. As the steam leaves the water, the water cools, but if the superheated temperature was high enough, the water would not stop cooling. As the water slug leaves the pipe, the vertical water surface will emit vapor in all directions with little propulsive effect, while the bottom surface will act like a rocket engine. But would this be enough to punch a hole in a ceiling? 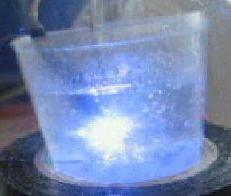 Well, we know that if a kilojoule capacitor discharge propels a water colunmn upwards, the water can punch a hole through a thick aluminum plate (tested by Richard Hull and Dr. Peter Graneau http://www.geocities.com/waterfuel111/water_explosion_graneau2_03.gif ). Yet in this capacitor experiment, turbulent disruption converted their water column into a water spray after a few feet of travel through the air. But what happens when a superheated water slug sends steam outwards in all directions at high velocity? Maybe this would help preserve the shape of the water column on its journey towards the ceiling. Tesla’s New York laboratories had several sections. This complex was arranged as a multi-level gallery, providing a complete research and produc­tion facility. Tesla fabricated several of his large transformers and generators in the lower floors, where the machine shops of this building were housed. The upper floors contained his private research laboratories. He had attracted a loyal staff of technicians. Of all these, Kolman Czito was a trusted friend who would stand by Tesla for the remainder of his life. Czito was the ma­chine shop foreman in each of Tesla’s New York laboratories. Tesla observed that instantaneous applications of either direct or alternat­ing current to lines often caused explosive effects. While these had obvious practical applications in improvement and safety, Tesla was seized by certain peculiar aspects of the phenomenon. He had observed these powerful blasts when knife-switches were quickly closed and opened in his Polyphase Sys­tem. Switch terminals were often blasted to pieces when the speed of the switchman matched the current phase. Tesla assessed the situation very accurately. Suddenly applied currents will stress conductors both electrically and mechanically. When the speed of the switch-action is brief enough, and the power reaches a sufficiently high crescendo, the effects are not unlike a miniature lightning stroke. Electricity initially heats the wire, bringing it to vapor point. The continual application of current then blasts the wire apart by electrostatic repulsion. But was this mechanistic explanation responsible for every part of the phenomenon? 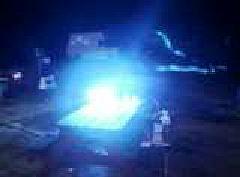 The most refractory metals were said to be vaporized by such electrical blasts. Others had used this phenomenon to generate tiny granular diamonds. Yes, there were other aspects about this violent impulse phenomenon, which tantalized him. Sufficiently intrigued, he developed a small lightning “gen­erator” consisting of a high voltage dynamo and small capacitor storage bank. His idea was to blast sections of wire with lightning-like currents. 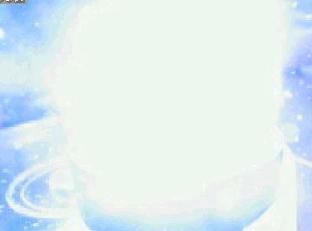 He wanted to observe the mechanically explosive effects, which wires sustain under sud­den high-powered electrifications. Instantaneous applications of high current and high voltage could literally convert thin wires into vapor. Charged to high direct current potentials, his capacitors were allowed to discharge across a section of thin wire. Tesla con­figured his test apparatus to eliminate all possible current alternations. The application of a single switch contact would here produce a single, explosive electrical surge: a direct current impulse resembling lightning. At first Tesla hand-operated the system, manually snapping a heavy knife switch on and off. This became less favorable as the dynamo voltages were deliberately increased. He quickly closed the large knife switch held in his gloved hand. Bang! The wire exploded. But as it did so, Tesla was stung by a pressure blast of needle-like penetrations. Closing the dynamo down, he rubbed his face, neck, arms, chest, and hands. The irritation was distinct. He thought while the dy­namo whirred down to a slow spin. The blast was powerful. He must have been sprayed by hot metal droplets as small as smoke particles. Though he examined his person, he fortunately found no wounds. No evidence of the stinging blast, which he so powerful felt. Placing a large glass plate between himself and the exploding wire, he performed the test again. Bang! The wire again turned to vapor…but the pres­sured stinging effect was still felt. But, what was this? How were these sting­ing effects able to penetrate the glass plate? Now he was not sure whether he was experiencing a pressure effect or an electrical one. The glass would have screened any mechanical shrapnel, but would not appreciably shield any elec­trical effects. Through careful isolation of each experimental component, Tesla gradu­ally realized that he was observing a very rare electrical phenomenon. Each “bang” produced the same unexpected shock response in Tesla, while exploding small wire sections into vapor. The instantaneous burst produced strange effects never observed with alternating currents. The painful shock­ing sensation appeared each time he closed or opened the switch. These sud­den shock currents were IMPULSES, not alternations. What surprised him was the fact that these needle-like shocks were able to reach him from a distance: he was standing almost ten feet from the discharge site! These electrical irritations expanded out of the wire in all directions and filled the room in a mystifying manner. He had never before observed such an effect. He thought that the hot metal vapor might be acting as a “carrier” for the electrical charges. This would explain the strong pressure wave ac­companied by the sensation of electrical shock. He utilized longer wires. When the discharge wire was resistive enough, no explosion could occur. Wire in place, the dynamo whirred at a slower speed. He threw the switch for a brief instant, and was again caught off guard by the stinging pressure wave! The effect persisted despite the absence of an explosive conductor. Here was a genuine mystery. Hot vapor was not available to “carry” high voltage charges throughout the room. No charge carriers could be cited in this instance to explain the stinging nature of the pressure wave. So what was happening here? The pressure wave was sharp and strong, like a miniature thunderclap. It felt strangely “electrical” when the dynamo voltage was sufficiently high. In fact, it was uncomfortably penetrating when the dynamo voltage was raised beyond certain thresholds. It became clear that these pressure waves might be electrified. Electrified sound waves. Such a phenomenon would not be unexpected when high voltages were used. Perhaps he was fortunate enough to observe the rare phenomenon for the first time. He asked questions. How and why did the charge jump out of the line in this strange manner? Here was a phenomenon, which was not described in any of the texts with which he was familiar. And he knew every written thing on electricity. Thinking that he was the victim of some subtle, and possibly deadly short circuit, he rigorously examined the circuit design. Though he searched, he could find no electrical leakages. There were simply no paths for any possible corona effects to find their way back into the switching ter­minal, which he held. Deciding to better insulate the arrangement in order that all possible line leakages could be eradicated, he again attempted the experiment. The knife switch rapidly closed and opened, he again felt the unpleasant shock just as painfully as before. Right through the glass shield! Now he was perplexed. Desiring total distance from the apparatus, he modified the system once more by making it “automatic”. He could freely walk around the room during the test. He could hold the shield or simply walk without it. A small rotary spark switch was arranged in place of the hand-held knife switch. The rotary switch was arranged to inter­rupt the dynamo current in slow, successive intervals. The system was actu­ated, the motor switch cranked it contacts slowly. Snap … snap … snap … each contact produced the very same room-filling irritation. This time it was most intense. Tesla could not get away from the shocks, regardless of his distance from the apparatus across his considerably large gallery hall. He scarcely could get near enough to deactivate the rotating switch. From what he was able to painfully observe, thin sparks of a bright blue-white color stood straight out of the line with each electrical contact. The shock effects were felt far beyond the visible spark terminations. This seemed to indicate that their potential was far greater than the voltage ap­plied to the line. A paradox! The dynamo charge was supplied at a tension of fifteen thousand volts, yet the stinging sparks were characteristics of electro­static discharges exceeding some two hundred fifty thousand volts. Some­how this input current was being transformed into a much higher voltage by an unknown process. No natural explanation could be found. No scientific explanation sufficed. There was simply not enough data on the phenomenon for an answer. And Tesla knew that this was no ordinary phenomenon. Somewhere in the heart of this activity was a deep natural secret. Secrets of this kind always opened humanity into new revolutions. Tesla considered this strange voltage multiplying effect from several viewpoints. The problem centered around the fact that there was no magnetic induction taking place. Transformers raise or lower voltage when current is changing. Here were impulses. Change was happening during the impulse. But there was no transformer in the circuit. No wires were close enough for magnetic inductions to take place. Without magnetic induction, there could theoretically be no transformation effect. No conversion from low to high voltage at all. Yet, each switch snap brought both the radiating blue-white sparks and their painful sting. Tesla noted that the strange sparks were more like electrostatic discharges. If the sparks had been direct current arcs reaching from the test line, he would surely have been killed with the very first close of the switch. The physical pressure and stinging pain of these sparks across such distances could not be explained. This phenomenon had never been reported by those who should have seen and felt its activities. Tesla gradually came to the conclusion that the shock effect was some­thing new, something never before observed. He further concluded that the effect was never seen before because no one had ever constructed such a powerful impulse generator. No one had ever reported the phenomenon be­ cause no one had ever generated the phenomenon. Tesla once envisioned a vortex of pure energy while looking into a sunset. The result of this great Providential vision was Polyphase current. A true revelation. But this, this was an original discovery found through an accident. It was an empirical discovery of enormous significance. Here was a new electrical force, an utterly new species of electrical force, which should have been incorporated into the electrical equations of James Clerk Max­well. Surprisingly, it was not. Tesla now questioned his own knowledge. He questioned the foundations on which he had placed so much confidence in the last several years. Max­well was the “rule and measure” by which all of Tesla’s Polyphase genera­tors had been constructed. Tesla penetrated the validity of Maxwell’s math­ematical method. It was well known that Maxwell had derived his math­ematical descriptions of electromagnetic induction from a great collection of available electrical phenomena. Perhaps he had not studied enough of the phenomena while doing so. Perhaps newer phenomena had not been discovered, and were therefore unavailable to Maxwell for consideration. How was Maxwell justified in stat­ing his equations as “final”? In deriving the laws of electromagnetic induc­tion, Maxwell had imposed his own “selection process” when deciding which electrical effects were the “basic ones”. There were innumerable electrical phenomena, which had been observed since the eighteenth century. Maxwell had difficulty selecting what he considered to be “the most fundamental” induction effects from the start. The selection process was purely arbitrary. After having “decided” which induction effects were “the most fundamen­tal”, Maxwell then reduced these selected cases and described them math­ematically. His hope was to simplify matters for engineers who were design­ing new electrical machines. The results were producing “prejudicial” re­sponses in engineers who could not bear the thought of any variations from the “standard”. Tesla had experienced this kind of thematic propaganda be­fore, when he was a student. The quantitative wave of blindness was catching up with him. Tesla and others knew very well that there were strange and anomalous forms of electromagnetic induction, which were constantly, and accidentally being observed. These seemed to vary as the experimental apparatus varied. New electrical force discoveries were a regular feature of every Nature Magazine issue. Adamant in the confidence that all electrical phenomena had been both observed and mathematically described, academicians would be very slow to accept Tesla’s claims. But this academic sloth is not what bothered Tesla. He had already found adequate compensation for his superior knowledge in the world of industry. Tesla, now in possession of an effect, which was not predicted by Maxwell, began to question his own knowledge. Had he become a “mechanist”, the very thing which he reviled when a student? Empirical fact contradicted what that upon he based his whole life’s work. Goethe taught that nature leads humanity. The choice was clear: accept the empirical evidence and reject the conventional theory. For a time he struggled with a way to “derive” the shock effect phenomenon by mathematically wrestling “validity” from Maxwell’s equations … but could not. A new electrical principle had been revealed. Tesla would take this, as he did the magnetic vortex, and from it weave a new world. What had historically taken place was indeed unfortunate. Had Maxwell lived after Tesla’s accidental discovery, then the effect might have been included in the laws. Of course, we have to assume that Maxwell would have “chosen” the phenomenon among those, which he considered “fundamen­tal”. There was no other way to see his new discovery now. Empirical fact contradicted theoretical base. Tesla was compelled to follow. The result was an epiphany, which changed Tesla’s inventive course. For the remainder of his life he would make scientific assertions, which few could believe, and fewer yet would reproduce. There yet exist several reproducible electrical phenomena, which cannot be predicted by Maxwell. They continually appear whenever adventuresome experimenters make accidental observations. I want to reference a very significant book that all steam enthusiasts should know about. “The Pictorial History of Steam Power” by J.T. van Riemsdijk and Kenneth Brown, 1980 Octopus Books Limited, ISBN-0-7064-0976-0. A very interesting sub-chapter called Efficient Use of Steam begins on page 56. This is a rare book and I highly recommend reading it from cover to cover. This book describes Stephenson’s link motion valve gear, which is the main inspiration for the variable valve lift feature of the L912 injector valve. It not only has wealth of drawings but also seriously discusses steam theory. This book covers everything if you look closely enough and it is a pleasure to read. As this article progresses you will find the scope will become quite advanced, taking what was learned in the past and applying it to the advancement of the technology and building on it successfully, without breaking any laws of thermodynamics. It does, however, take advantage of more than just the “first and second laws”. J.W. 10/25/2002. During my experience as an A.S.E. master automotive technician. I often wondered why so called critics believe that flash steam engines cannot be built. And at the time I was studying thermodynamics. To better understand turbochargers. And how they positively affect the performance of internal combustion engines. Needless to say I learned much on how turbochargers actually work. Also I studied using water injection as an intercooler in diesel turbo applications. Which I found very very interesting. And can tell you this is common practice at “today’s” diesel tractor pulls. It is how they maintain such high boost pressures. Since all turbo’s work on a principle of heat of compression in the impeller section. I mention this because it is important to have a diverse background of study. And most who attempt flash steam engine construction do not. The same can be said of those who criticize such engines. But that being said, people tend to interpret things differently. It is inevitable that there will be a different view of the same thing. And this is usually learned by experimentation and reproducible results. I am enthusiastic about the prospect of a flash steam engine. Many years ago I begun my own research and development to explore this possibility. The very first thing I was concerned with was the primary heat source for such an engine. Certain prerequisites had to be established. Cost of the fuel was of primary concern. Since I have put in hundreds of hours testing external combustion chambers. And fuel can be expensive over time. Feed corn is the solid fuel of choice. It’s cheap and burns remarkably clean. But most importantly has “tons” of btu energy per weight. I disagree with those who say corn should not be burned as a fuel. It is a shame to see “mountains” of feed corn simply rot in distribution locations since there’s no buyers. After all the American farmer almost always loses money on this crop. Since there is sometimes an excess supply. In this application it can be used directly without ANY processing. It can be burned in external combustion chambers. Burning corn in an ideal combustion chamber, is considered as a high-grade heat source as fuel oil. For this purpose. The real benefit here is that the corn does not require further processing. Such as is the case with ethanol or other alternative liquid fuels. Making it cheaper to use in this application. In fact it has been speculated that if it wasn’t for the cheap price of corn. building a steam engine of this type wouldn’t be economically reasonable. because this type of steam engine will in fact operate with the other fuels. But I wouldn’t go so far as to say any heat source will do. You need a high-grade heat source to make this work. When this reaches a commercial stage the fuel will be cheap enough to make it economically attractive. As far as the super efficiencies that have been claimed by people in the past. That is still unclear. But the flash steam engine may be made to operate. That is clear. So with the heat source situation under control, I set off to create a flash steam engine. And decided to base my flash steam engine on a four stroke engine. I want to point out some benefits to using an four stroke engine. First is compression stroke, it makes heat and this is good. second is the intake manifold vacuum it’s good because it can draw steam thru a condenser. And since the spark plug only fires once during two rotations of the crankshaft. It has a conservative operating schedule. So I said why not, lets inject superheated water thru the spark plug port. It should flash and produce pressure and cause the engine to run. My first attempt was to run an engine off solenoid valves. I used argon just to test the idea. The first engine was a 2.2 liter 4 cylinder Toyota engine. And I used on shelf Honeywell 12 volt pilot operated solenoid valves. Set up a timing system to operate them. Plumbed them to the engine and connected a 2600psi argon tank to the thing. Believe it or not it worked. The highest engine speed I got was about 600rpm. And it ran about 3 minutes or so. And it could not be throttled. I tried using a ball valve but the engine either half choked itself or ran as fast as it could. Needless to say the dynamics were way off. And I deemed that type of valve unusable for flash steam injection. And I immediately realized the seat of the valve, needed to be inside the combustion chamber. Or as close to it as possible. The next thing that became painfully clear was the need to throttle the engine. The ball valve just wouldn’t do. The injection valve itself needed to have variable valve lift to throttle engine. Then the pressure source could be unobstructed in its passage to the valve. Eliminating dynamic flow problems. And it didn’t take long for me to realize nobody sells a valve like this. So I started my own company and built one. Once I had a good working valve in hand I was able to do the real experimenting. And I learned a lot real fast. Please bear in mind that the experiments described here, were performed about two years ago. From the date of this writing. And this specifically pertains to moving a piston with flash steam not argon. Anyway here’s what happened. 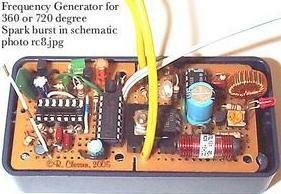 I modified a 11hp Briggs and Stratton engine to accept the L912Injector. Then set about discharging it while it was installed on the engine. First I rotated the engine to top dead centre on the compression stroke. Then installed the injector, heated it up and discharged it. Just like you see in the picture above. Except that it was discharging into the combustion chamber of the engine. The injector developed an internal pressure of about 3000psi. If the concept was to be sound, I needed good results from a static test such as this. So I crossed my fingers and discharged the injector into the engine. I was astonished to see that nothing happened. The piston didn’t move one millimeter. I was overcome with disbelief. The engine was suppose to turn over but it did not. And I knew that if the engine did not rotate thru a compression stroke. In a static test, then it would not operate at speed. Or perhaps not at all. I asked myself what is going on here. This should work, the results in open air discharge were so fantastic. So I decided to put some more thought in to it. A day or two later I figured out what was happening. Flash steam can form, or condense in a micro-second. Generally your expecting it to flash instantaneously when your trying to run an engine off flash steam. And this is possible. but it can destabilize just as quickly. And this is what was happening in my experiment. I was producing the flash steam just fine. But the engine block was cold. And it absorbed the flash steam directly into water. Almost producing a vacuum it was happening so fast. The room I was working in was air-conditioned and at a temp of 74°f. The mass of the engine block was at equilibrium with the room temp. And since the mass of the engine block was so much greater than the mass of the actual flash steam discharge. It simply absorbed it. This is probably the most important thing to consider when contemplating a flash steam engine. Back to the static test. I then proceeded to take a small propane torch and heat the block and cylinder head of the 11hp Briggs and Stratton engine. First I heated it to 180°f. Then set up the experiment same as before and discharged the injector. This time it worked. The engine kicked over about 740°of rotation. At 212°f the results were almost twice as good. In fact the rotation of the engine was so dramatic the engine almost jumped off the table. This is a very important thing to learn. And what is going on in this situation must be watched very closely. Since it is a relative factor that will affect performance drastically. For example It has been observed causing extended run times, in four-cycle engines running on argon. The hotter the engine block the better the performance. It has been observed in engines that are running on argon for ice to form on the exhaust valve stem. And the block is generally cooled by the compressed argon. but if you heat the block before running the engine. You will always get better performance. So this phenomenon is relative even in non-flashsteam applications. As should be the case. But the effect is much more critical in the case of a condensable vapor such as flash steam. It is important to understand the concept of engine block heating. In fact this is common practice even with live steam engines. I believe its called steam jacket, or flowing a small amount of steam around the cylinder casting. This practice always promotes further expansion of the steam in the cylinder. Their by increasing efficiency. And is necessary on the flash steam engine as well. Except on a flash steam engine live steam is only present in the cylinder and exhaust. And if you are running the engine on flash steam, the hot water that your injecting into the engine. Will flash and release heat. And this is working in your favor. However all the engines that I work with, have a mechanism to heat the block. But the mechanism to heat the injected water is always more substantial.